No one wants to rush Mark. There’s something fabulous about watching someone have an absolutely fantastic time. Right now, he’s the friend who dances unabashedly, eyes closed, when no one else is on the dance floor. Lost in the moment; hips swaying. Who wants to bust in on that rhythm?! Mark kicks and swims. No face to be seen. 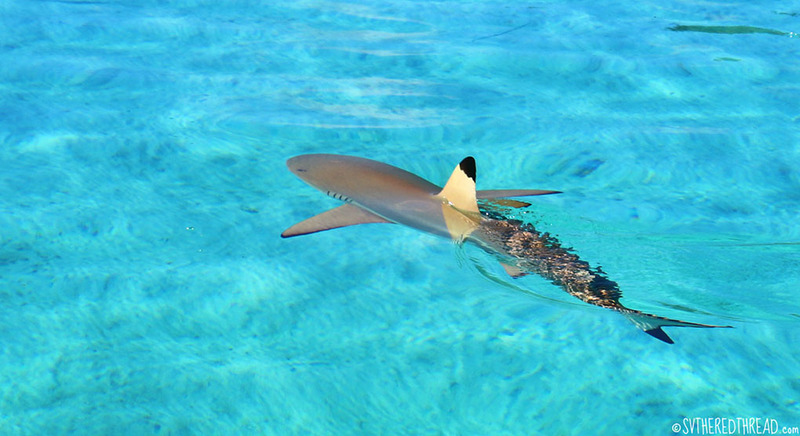 His snorkel is perpendicular to the aquamarine lagoon, where tiny fish, meter-long sharks and velvety stingrays mingle. Mark wears glasses. The coolest glasses. 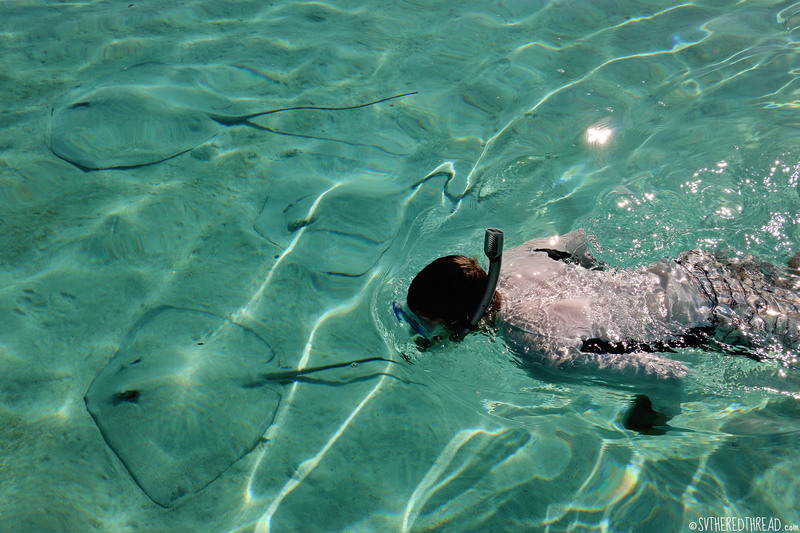 He has never snorkeled before—not ever—and somehow his vision is as clear under water as it is above. A fry becomes a fish. 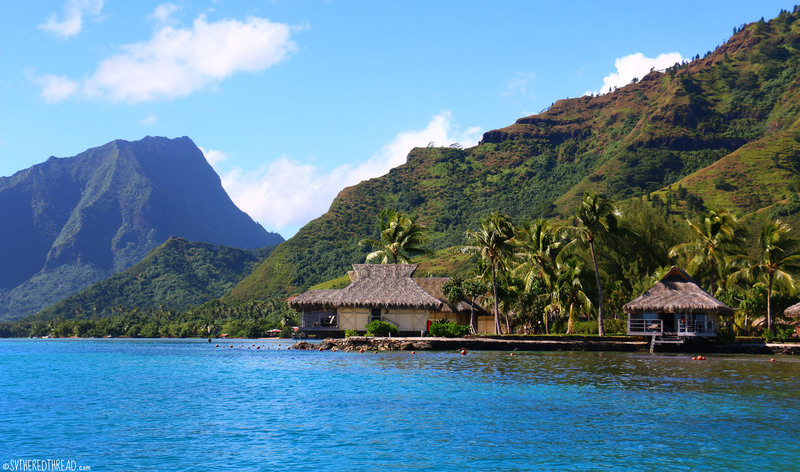 We awoke to the light of daybreak painting the cliffs of Moorea in a silhouetted panorama of grandeur, the morning sun scaling the peaks. 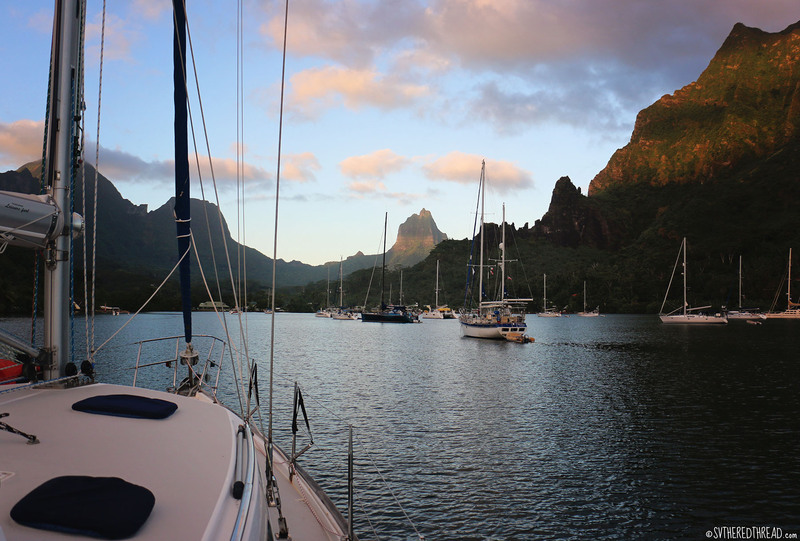 Island pinnacles brushed with shades of green from every corner of the palette hugged the anchorage; a mill pond. Peace. Harmony. Our next anchorage was less than two hours away. The air was heavy with the salty breath of dawn. Time to hoist the anchor; it’s 6:45 am. 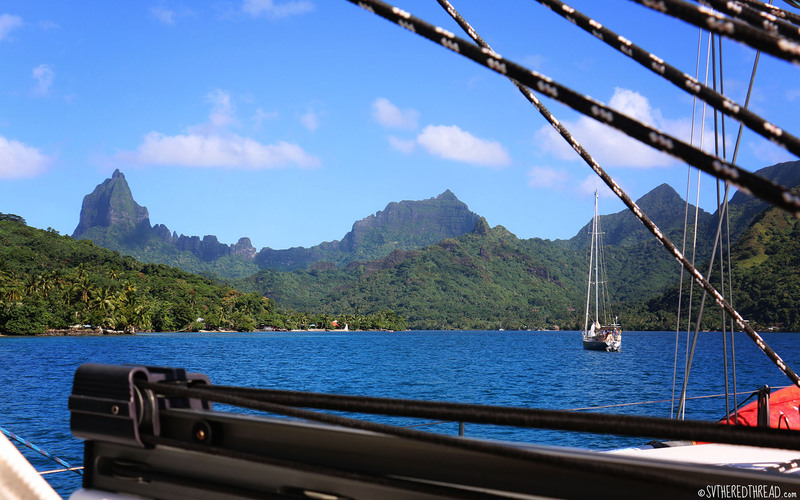 The Tahiti-Moorea Sailing Rendezvous concluded a day ago…what fun! 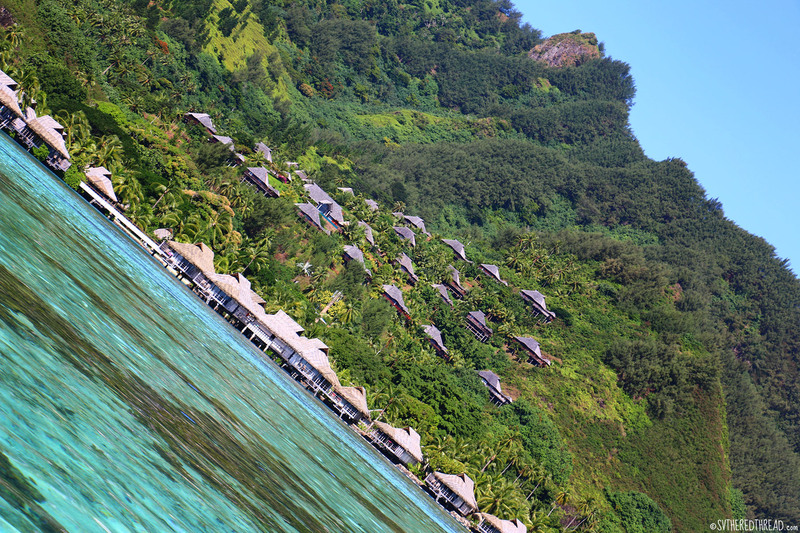 There is much exploring to be done on Moorea. What’s next? It’s half past 8 o’clock, and our hook is already snug on the bottom of Opunohu Bay. Time for a second pot of coffee; coffee is essential…and potatoes and eggs. 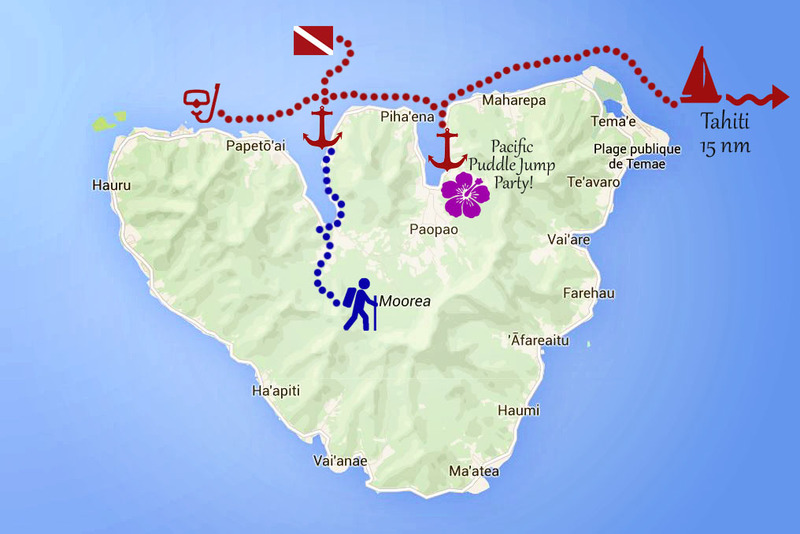 Opunohu Bay anchorage waypoint: 17°29’.49S 149°51’.11W We piled into Ms. Sassy, four sets of snorkel gear in tow. 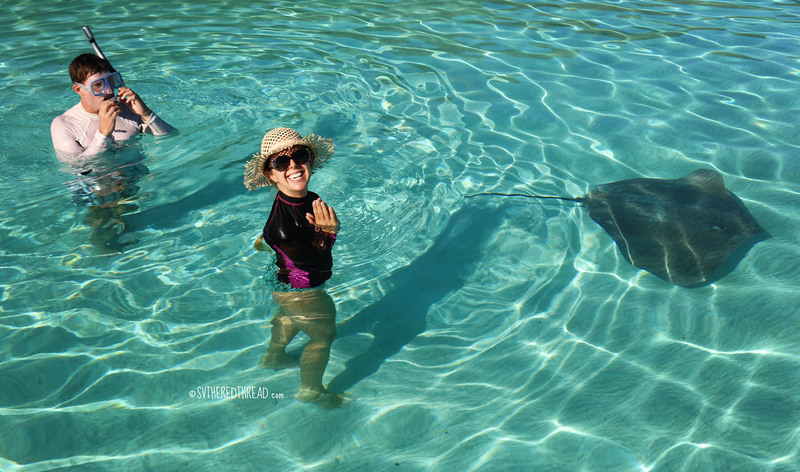 We were eager to decide for ourselves whether swimming with stingrays lives up to the hype. We tossed our dinghy anchor in water so shallow it lapped at my elbows when I stood flat-footed upon the white sand dotted with bommies and the black tips of small sharks. Neil, the ever-curious sea baby was the first to bail into the water. 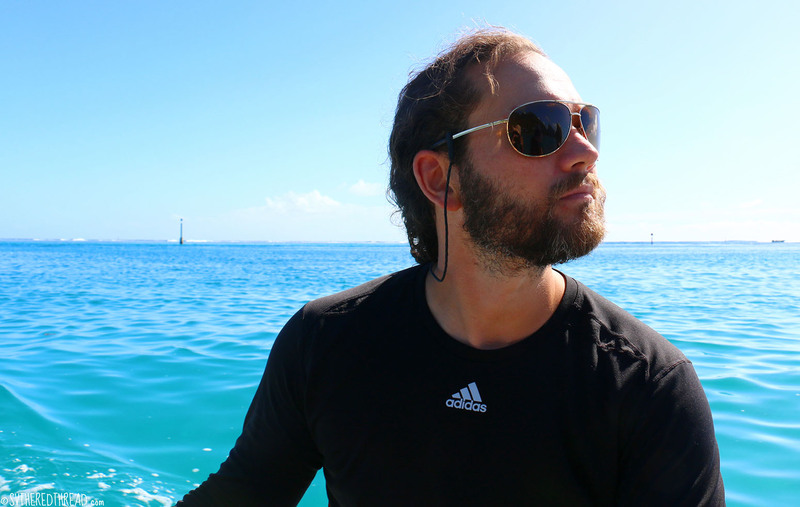 French Polynesia’s newest snorkeler, the giddy and intrepid Mark, swam and swam and swam. 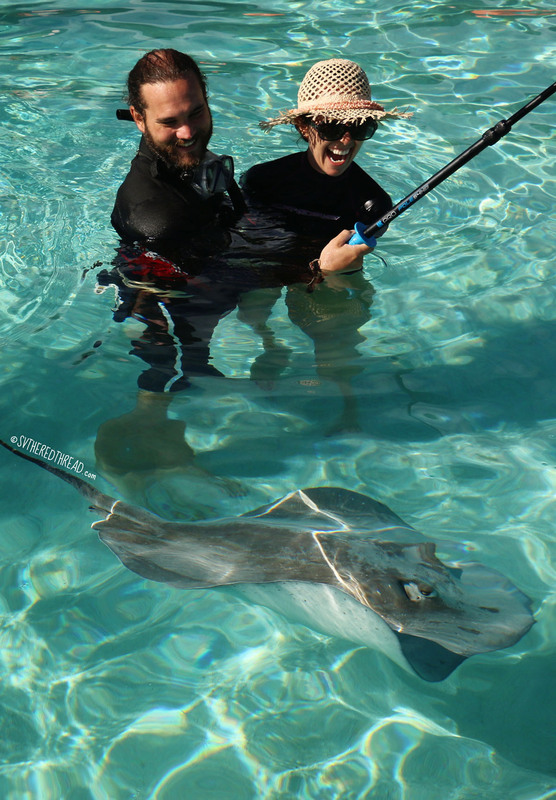 Stingrays glided beautifully through the water, but we couldn’t help but feel a twinge of nervousness about their presence. 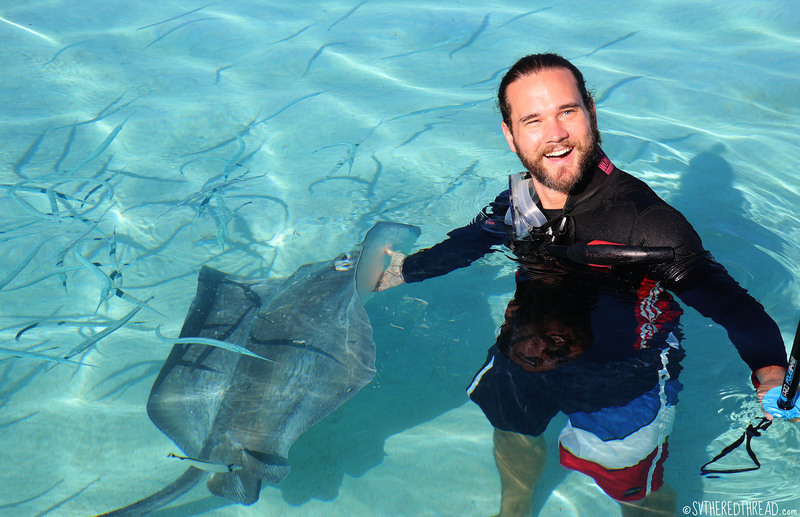 We’d seen stingrays during prior scuba dives, but close encounters with the creatures were still novel. 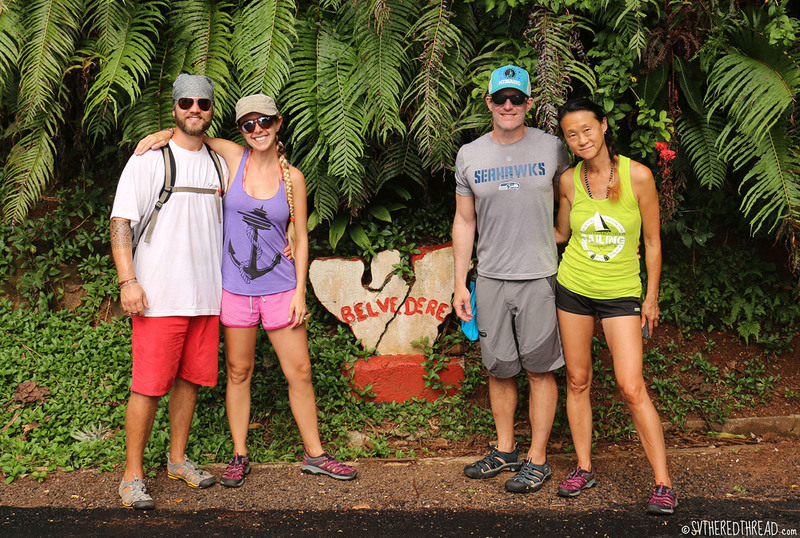 We’d only seen a fever of them (yes, that is what a group of stingrays is actually called) one time prior, at Los Tunneles in the Galápagos. By 10 o’clock, tourist boats crowded the area. The bait they tossed in the water enticed the stingrays and sharks away from our small group, and water visibility declined. 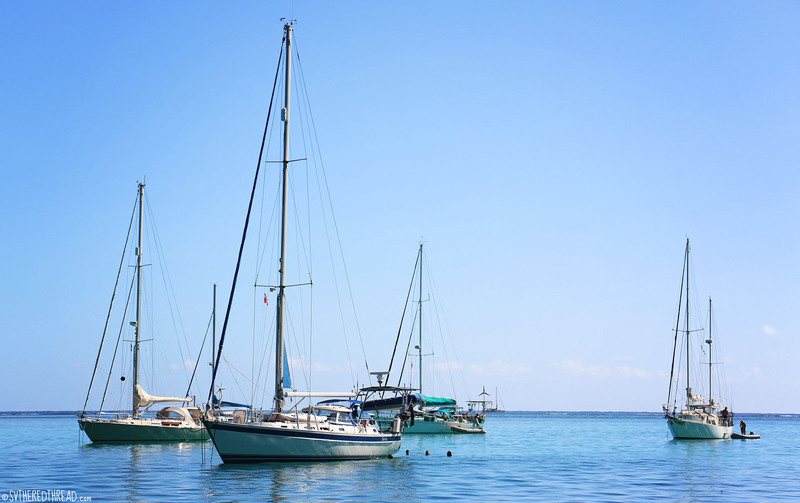 We piled back into the dinghy, plucked Mark from his snorkel, and headed back to Red Thread. A nap and a Hinano awaited us. Afternoons in Opunohu Bay were spent playing in the water and exploring on sweaty hikes. 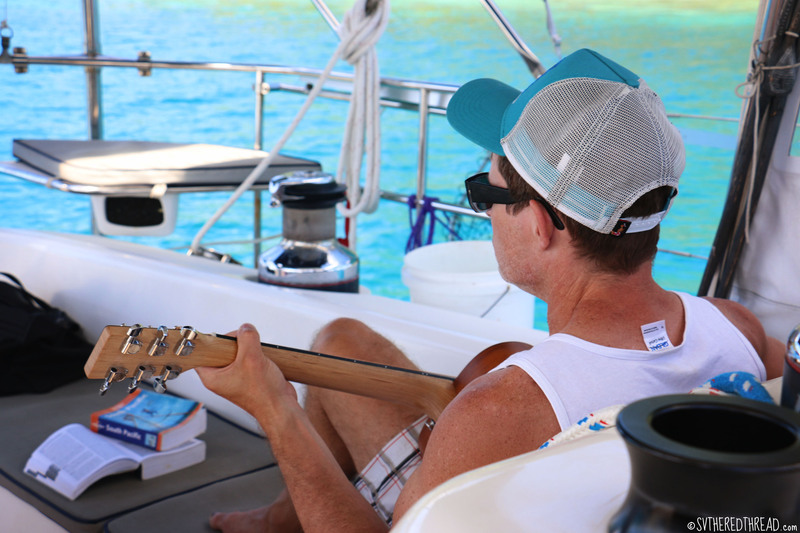 Neil and Richard from s/v Sarita dinghied out of the reef pass for a scuba dive, during which they saw their first lemon shark, a 2-meter monster they later identified while flipping through our Audubon field guide over beers. 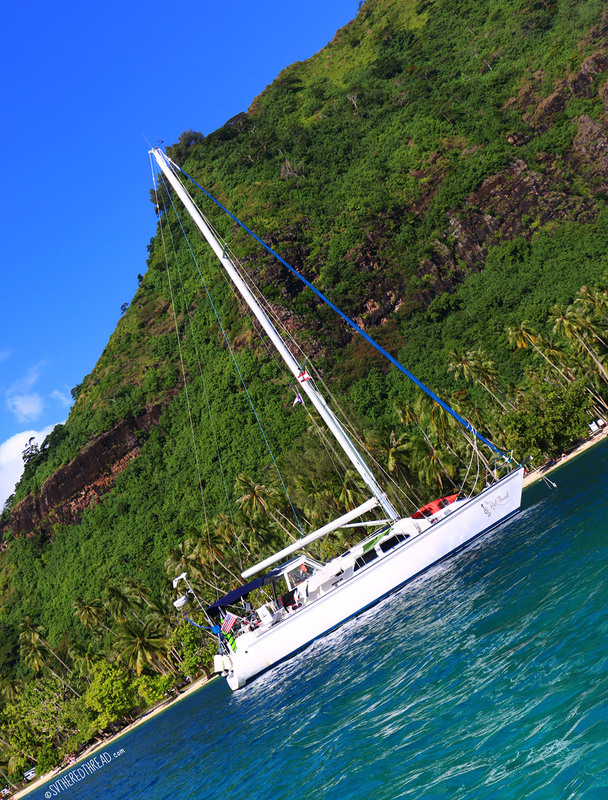 See the photo of beautiful Sarita below; notice the bobbing heads of her crew in the water behind the stern. One day, we wandered the road that runs along the eastern length of the bay and climbed a hill to an empty, open-air restaurant. There, dancing ants tickled the buds of vanilla orchids and beans curled lazy in the warmth of the tropical sun. 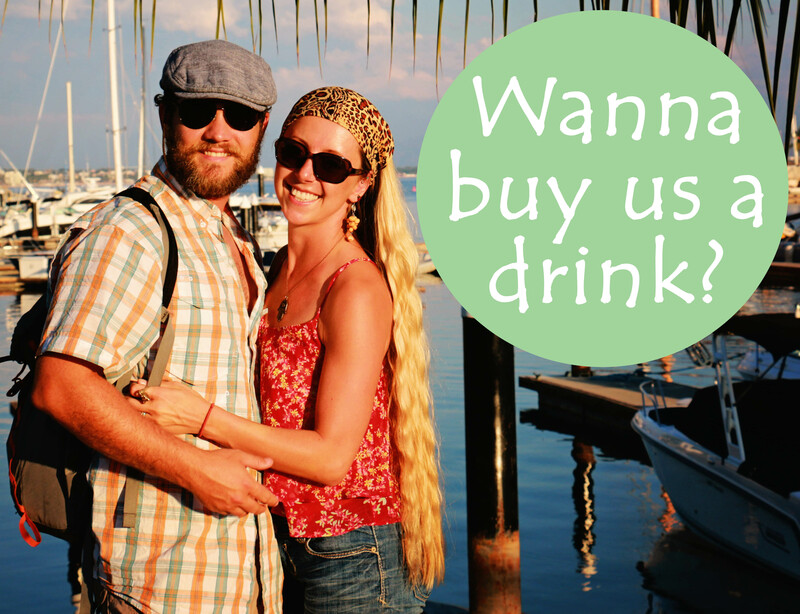 An attractive Polynesian grandmother shared guava jam with us; we bought a jar. There were hibiscus and gardens of flowers we’d never seen before. Another day, we spent a couple hours tramping our way to the belvedere, where we stared through the two arteries that transect the heart-shaped island’s northern coast. The humidity kissed our skin, and as we hiked the air grew cooler, giving our damp skin the slightest chill. The scent of damp earth and decaying leaves hung in the air and heavy tropical clouds nuzzled the necks of the cliffs. We wandered past an archeological site and stopped for a beer, perched on a log and listened to the sounds of the jungle. Few birds reside in islands in this part of the world. At some moments, it can be so quiet you can almost hear the trees whispering. 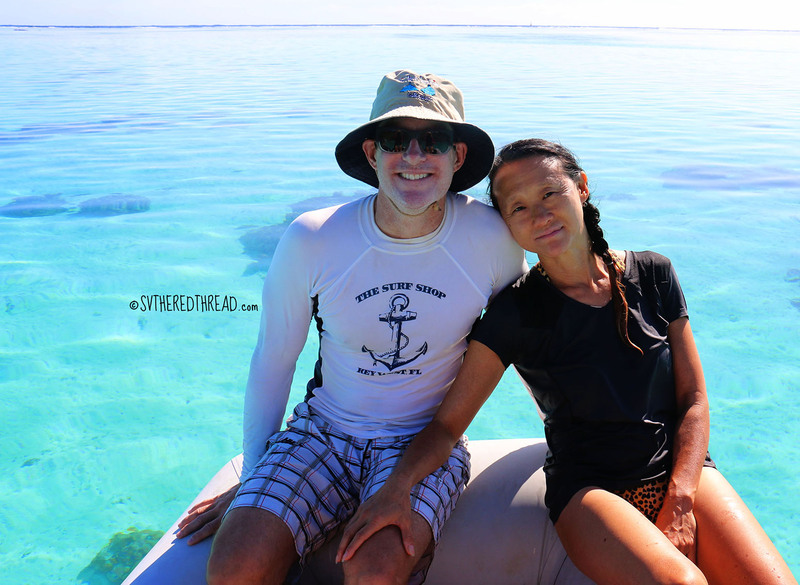 During our final morning on Moorea, we returned early to bid the stingrays and sharks g’day, hoping we could avoid sharing the experience with anyone else. The nervousness I had felt during our first stingray encounter had mostly evaporated, making room for me to feel the full intensity of my excitement. Being close to the creatures was thrilling, and I struggled to contain squeals of delight! What does it feel like when a creature you’ve been told to fear swims nears you…and you don’t retreat…and then you reach out and touch it? 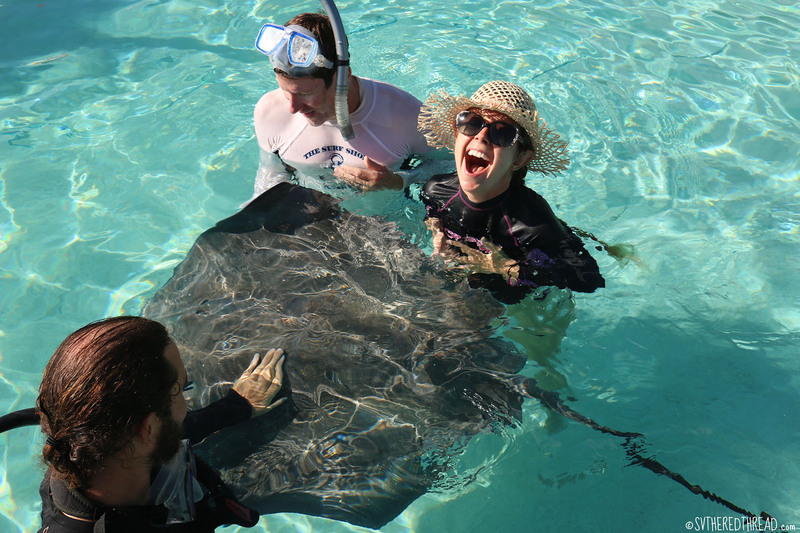 I assumed that a stingray would feel course, like fine-grit sand paper. Or perhaps just firm, like a flat stone tile. No, they feel like velvet or the fuzz of a summer peach. Their wings, like those of a dancer charming a sheet of satin, flutter and curl over curious hands. I wondered if they enjoyed the tickle of human hands or whether they were hoping for a treat, something they’d become accustomed to through tourism. 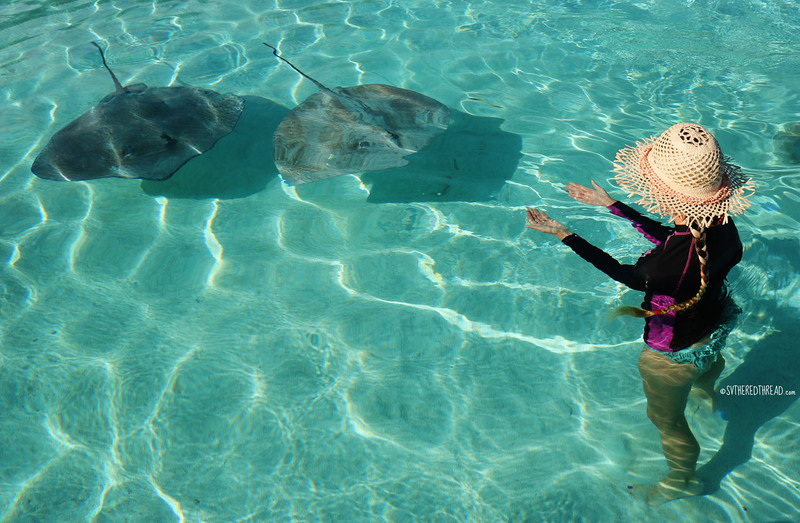 I suppose that the sad epilogue to our experience was that we later learned that in some parts of the world, stingray health and behavior have been radically affected by tourism that involves supplemental feeding. Alterations in sleep-wake cycles, breeding patterns, and nutritional status have been documented in the Caribbean, for example. We had only brought a tin of tuna with us during each excursion—an offering suggested by other sailors and in which the creatures were wholly disinterested—but I worried that our excitement about the experience had been naïve. What if our curiosity to interact with the animals had done harm? I want us to be a part of solutions and stewardship—not destruction—however minimal. 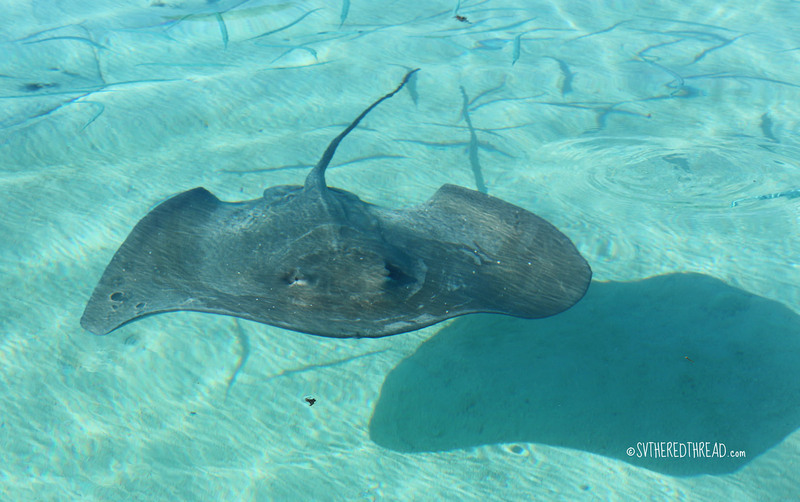 If you are preparing to visit islands where stingray encounters may be part of your experience, consider reading this article that summarizes the 2013 study published by Corcoran and colleagues before you go. 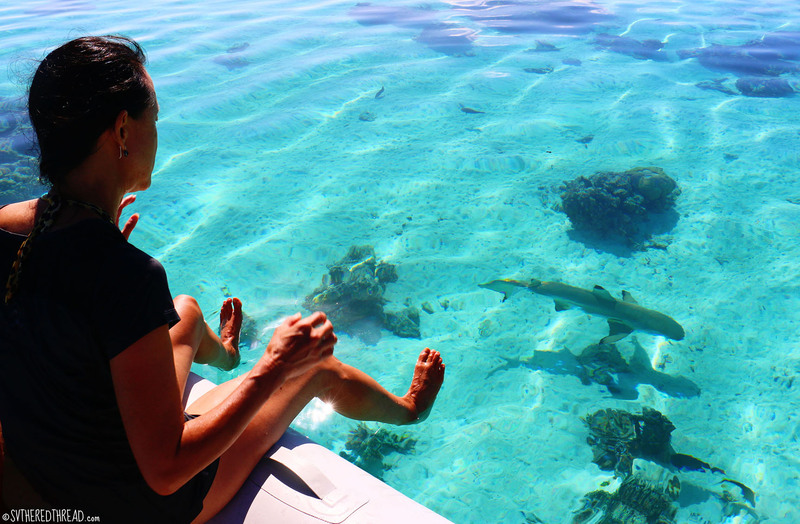 This entry was posted in By Jessie, French Polynesia, Friends and loved ones, Sea life, Snorkeling & Diving, Society Islands, South Pacific and tagged Blacktip sharks, Moorea, Stingrays, Tsaosons. Bookmark the permalink. Fantastic photos and recap. Truly memorable with The Red Thread and crew. So where are yall now? This looks so amazing! 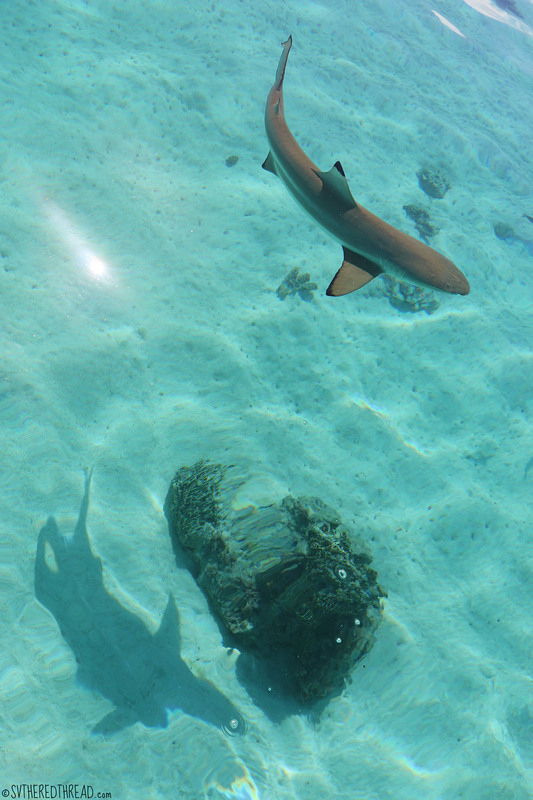 We snorkeled at Moorea several years ago when we went on holiday to Tahiti. Would be so much more fun to have been there on a sailboat.